The hotel shuttle conveniently drops us at the parking lot of Erichhütte on Saturday morning, from where the ascent to Königsjodler starts. In roughly 1,5 hours we make our way on trail 432 over two smaller snow patches and some easy scrambling to the start of the Ferrata. 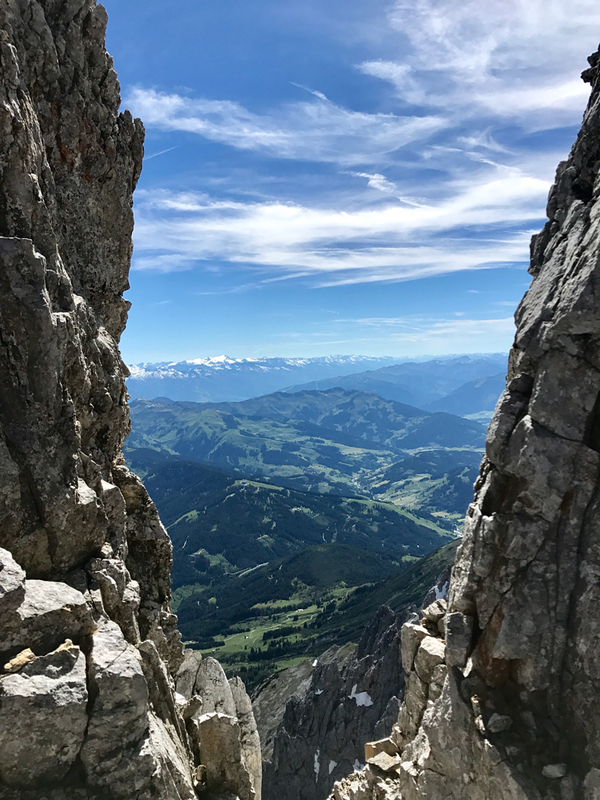 The start of the Ferrata is located on ~2310 meters and follows the ridge over the “Flower Tower”, “Mühlbacher Tower”, nine sharp rocky peaks called the “Teufelshörnl” and the “Kummetstein” via multiple draws and straddling steps. The single parts of the climb are not very difficult, it’s more the length and exposure and the seemless never-ending Up and Down the steel rope follows. There is one emergency exit in the last quarter of the Ferrata, which is really steep and as long as there is snow in the so called “Birgkar” absolutely not recommended. We pass some little snow patches and see a handfull of broken pro on the devil’s pillars, but apart from that we have perfect conditions: The weather is 100% safe (something that is absolutely mandatory to climb Königsjodler! ), the rock is dry and there are no other people in the Ferrata. For those reasons we are able to climb a steady pace without any hurry and, apart from the multiple photo and film stopps, make good progress. We take one break for food and drinks and everything goes smoothly as planned – we are able to enjoy the panoramique views and vistas at its fullest! Fixed ropes aaaaaall the way with a great line/route = BIG fun! We reach the exit of the Ferrata after roughly 4,5 hours of scrambling and climbing and after an inscription in the summit book we continue to Matrashaus, the hut right on top of the Hochkönig summit and our shelter for the night. Sunset @ Hochkönig summit: Awesomeness! No wind, sun, 17 degrees… just perfect! Conclusively said, the Königsjodler is one of the most treasured Ferrata’s in the Alps, but shouldn’t be underestimated! The weather and personal fitness should be adaequate for a day-long alpine trip – and if you`’re not sure about the current conditions, please check back with Roman at Matrashaus or at least the Hochkönig tourist information. Please note that most of the people take 10-12 hours for the whole trip and so you should make sure to start early enough (especially when you plan to descend the same day)! Königsjodler, thanks for gifting us with a perfect day – it was a pleasure! In friendly cooperation with Übergossene Alm Resort. More information: www.uebergossenealm.at – thank you!